Famed for their delectable and exquisite bespoke cakes, Spatula has moved from Joo Chiat to Frankel and now at Baghdad Street. Unlike the previous two locations, the new space is bigger and it houses a cafe that serves a decent range of homely Western food at an affordable price. Think scrumptious dishes such as Grilled Cheese Croissantwich, Margherita Pizza Toast, Milkshakes, Waffles and many more! It’s second storey also welcomes all sorts of occasion, be it for birthday parties or corporate events. So, are you working around the area? If yes, you might wanna drop by Spatula for lunch with your colleagues without hurting your wallet! Or if you’re looking for an event space, you might also wanna consider this Halal cafe! 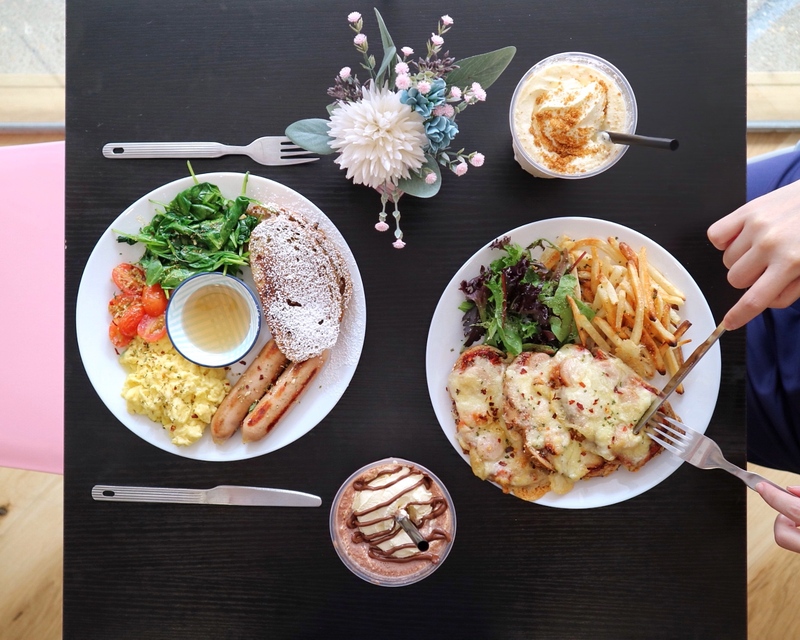 Here’s a picture of our brunch paired with 2 cups of sinful but delicious milkshakes from Spatula. With the weather being so hot these days, these milkshakes from Spatula came just at the right time! Rich and very creamy! Oh yes, remember not to drink too much of these before your food is served because they are super filling! The brunch platter comes with 2 slices of Cinnamon French Toasts, 2 Grilled Chicken Sausages, 2 Scrambled Eggs, Sautéed Spinach and Sautéed Tomatoes. Overall, this was quite a decent ‘Big Breakfast’! My favourite has to be the scrambled eggs which were soft and fluffy and it goes really well with the cinnamon French toasts! Nicely-toasted and generously melted with cheese, the Margherita Pizza Toast was flavoursome (good combination of sweet-savoury). Fries were also well-seasoned and crispy! Soft and fluffy cinnamon waffle paired with a classic and nostalgic Chocolate ice cream! Waffle was not too bad but I would have loved a richer chocolate ice cream! This was not too bad! For the price you are paying, this is super VALUE-FOR-MONEY! Caramelised bananas were not overly sweet and it goes really well with the classic Vanilla ice cream! I need this during a hot sunny afternoon! Previous PostSushi Chiharu Singapore: 18 Course Omakase Experience with 'Edomae Sushi' Originated 150 Years Ago! Next PostNesuto: Celebrates Christmas with New Enchanted High Tea Set, Exquisite Log Cakes & Festive Cookies!